What was your first Zelda game? Would you say it’s your favorite out of the series? How many Zelda games have you played? Recently, an extensive survey was conducted by a curious fan of the Zelda franchise, answering these questions and so many more. In fact, there’s such a plethora of information that was gathered, it can’t possibly be confined to a single article, so I’ll be sharing data concerning my earlier inquiries. While I’m sure some results won’t be very surprising, others may shock you. I hope you like math! The survey was created by Max Nichols, whose results will be partially provided here and interpreted by me. Max’s survey had 5,890 responses with the bulk of them originating from Zelda Informer, Zelda Universe, Reddit’s Zelda community, his friends, and his workplace. If you’d like to see the full results of his survey, check it out here! Now, without further ado, let’s dive in! One of the most common questions I’ve seen regarding the Zelda series asks which one people played first, so I figured it would be fitting to start with those results. While the answer I hear most often is indeed Ocarina of Time, I had no idea that it would have such a staggering lead over the game in second place. Considering the console Zeldas are grander in scope and garner more attention, it’s unsurprising to see that handheld Zelda games aren’t usually a person’s first experience with the franchise. 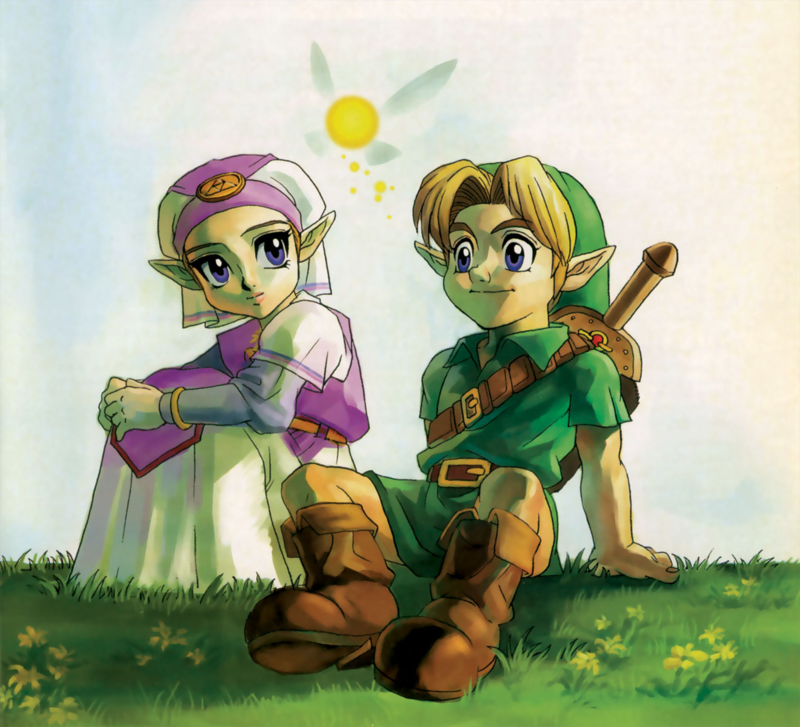 Another interesting result to note is that the newer Zelda games have rarely been the first for many people, meaning that although newer games are still drawing in fans, the older games are what have effectively made the fanbase what it is today. Nichols even shares a couple of quotes from participants, with many of them mentioning how an adult, friend, or sibling introduced them to the franchise with the same game that they were. 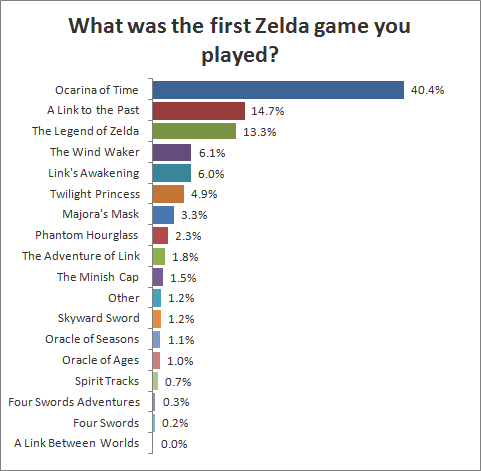 And based on these poll results, it’s clear that Ocarina of Time was an essential building block for the Zelda franchise. The people who chose the “Other” option either couldn’t remember or considered Super Smash Bros. their first Zelda game. So, we know what game most people have started with, but what Zelda games are the most played? 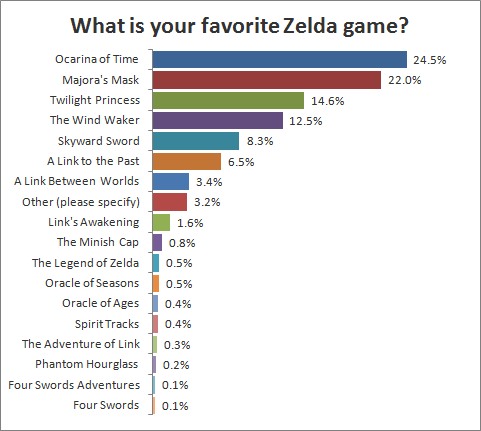 An enormous 97.5% of people in this survey have played Ocarina of Time with Twilight Princess closely following. Taking into account just how many units of the Wii were sold, I suppose it really isn’t surprising that so many people have played Twilight Princess. It’s also fascinating to see that despite the fact that so many Zelda games have been released, the only game to fall below the 50% mark is Four Swords Adventures, which still manages to come close. With the exception of Skyward Sword, the top 7 have had releases on several platforms, so the fact they have been played by the vast majority of fans is hardly shocking news. The “Other” option here refers to spinoff games, in case you were wondering. It would appear to a certain degree, yes, that is the case. For instance, Ocarina was on top again, but the gap between it and Majora’s Mask is nowhere near as significant as it was in the previous graph. Majora’s Mask and Twilight Princess were much lower on the list of games that people played first, but easily make the top 3 list when it comes to favorites. A Link Between Worlds wasn’t the first game played for anyone in the survey, but appears to be the highest-rated handheld game and even holds the seventh place overall. As for the people who cited “Other” on the graph? Most of them just couldn’t pick a favorite. Who can blame them?! Ocarina of Time: 35%. 1st place. Majora’s Mask: 57%. 1st place. Twilight Princess: 46%. 1st place. The Wind Waker: 47%. 1st place. Skyward Sword: 46%. 1st place. A Link to the Past: 21%. 1st place tie (with Majora’s Mask). Majora’s Mask is the clear winner here, with over half the people who said they played it first referring to it as their favorite Zelda game. Surprising, no? 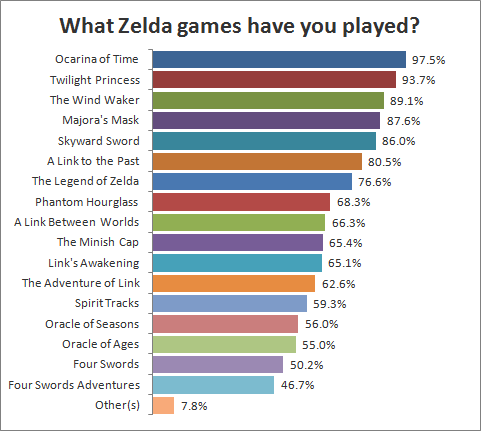 Ocarina of Time is usually the king when it comes to favorites, but apparently hardened veterans prefer Majora’s Mask by a small margin. And despite the fact that so many people have played Twilight Princess, longtime Zelda fans don’t seem to prefer it to the older games. Bonus poll time! 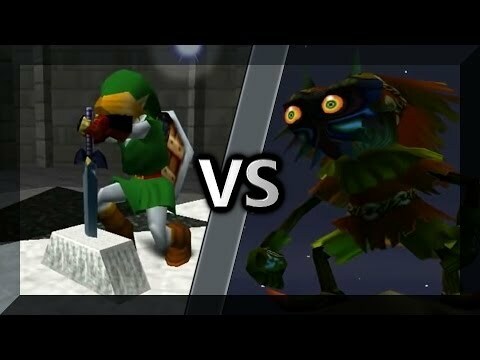 Nichols thought that it was necessary to have a showdown of favorites between Ocarina of Time and Majora’s Mask, so he decided to narrow things down to only people who had played both games. The results? Ocarina of Time just barely squeezes ahead with 25.75% compared to Majora’s Mask which ends up with 24.82%. So close! Whew! I must admit, some of the results were quite surprising. I’ve played every Zelda game released and despite Ocarina of Time being my first, I actually hold Twilight Princess the closest to my heart. What about you? Would you say your first Zelda is your favorite? Do these results surprise you? Don’t be shy! Let us know below!